Engineering Service Examination- ESE previously known as IES (Indian Engineering Services) is conducted by UPSC- Union Public Service Commission, for recruitment of engineers in the Engineering Services of the Government of India. 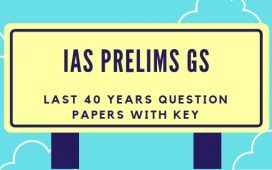 The preliminary Session of the examination was conducted on 07.01.2018and you can download the question papers with Complete Solutions of ESE Prelims 2018from the links given below.. The Engineering Services (Preliminary/Stage-I) Examination will consist of two objective type (multiple choices) questions papers and carrying a maximum of 500 marks. Only those candidates who are declared by the Commission to have qualified in the Preliminary/Stage-I Examination in the year will be eligible for admission to the Main/Stage- II Examination of that year provided they are otherwise eligible for admission to the Main/Stage-II Examination. The Marks obtained in Preliminary/Stage-I Examination by the candidates who are declared qualified for admission to the Main/Stage-II Examination will be counted for determining their final order of merit. The number of candidates to be admitted to the Main/Stage-II Examination will be about six to seven time the total approximate number of vacancies to be filled in the year through this examination. Completely solved question papers of all subjects/ categories are available below as pdf files. You can download the papers be clicking the corresponding links below.